The Daily Mirror sat with the General Secretary of the Communist Party of Sri Lanka (CPSL), Senior Minister DEW Gunasekara to discuss the current political and social issues in the country under the backdrop of the January Presidential election. "We continue with our agitation for constitutional reform. I must say that as far as the progressives are concerned, they had given their mandate on our occasions"
"As far as my Party is concerned, we totally opposed a hasty presidential election - We saw no reason to hold it earlier when we could go on for another two years; during which we would have done so much for the people. When we met the President, we made our position abundantly clear." "Presidential election is a transfer of power from one person to another, one Party to another, from one alliance to another alliance. This is not a Referendum for the abolition of the executive presidency. This is not a single-issue based election." QThe CPSL is vehemently opposed to the Executive Presidency since its introduction in 1978 but you are continuing to support President Mahinda Rajapaksa and his UPFA government despite broken promises given in 2005 under the Mahinda Chintana policy framework to abolish the Executive Presidency. How are you going to justify the action of your party? Yes, our Party as well as the other Left Parties staged a massive protest on the day that the new Constitution was enacted. We have continued to demand the abolition of the Executive Presidency since then. Further, it was one of the issues in our Election Manifestos of 1994, 1999, 2005 and 2010 at the instance of the Left Parties. Even today, we continue with our demand, despite the fact that we failed to achieve what we wanted. It was mainly due to the reason that there was no consensus amongst the Political Parties. Excepting the SLFP and Left Parties, all the other Parties like the UNP, TNA, JHU and the Muslim Congress etc. were in favour of the Executive Presidency. Secondly, in the Parliaments of 1994, 2000 and 2004 there was no 2/3 majority required for an enactment to the Constitution. Thirdly, it was only on one occasion we made an attempt to bring about consensus between UNP and SLFP. That attempt was proved abortive. In the present parliament, we secured a 2/3 majority and then the SLFP was not prepared to undertake such an undertaking, particularly in view of the on-going war. It was only after the termination of the war that we recommenced our agitation. We have now arrived at a crucial stage. All those who totally opposed abolition of the Executive Presidency are now vociferous in supporting the abolition. Whether they are sincere or not it is a positive gesture. There is no argument that the Executive Presidency was one of the major factors that led to the obliteration of separatist terrorism in 2009. But President Rajapaksa and the UPFA still manipulate to the extreme the war victory while many others have put the sense of triumphalism to the past. I am not someone who has subscribed to triumphalism. I also do not subscribe to the view that it was the Executive Presidency which contributed to the termination of the war. 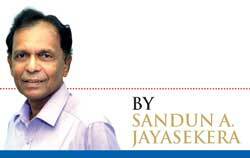 I do not want to underestimate the role of Mahinda Rajapaksa’s personality. There are so many other factors which contributed to the victory — unity of the security forces, close understanding between the police and the armed forces, war strategy, assistance from our friendly countries, management of the foreign policy, peoples’ support, substantial support from minority communities and religious dignitaries etc. History provides evidence that wars have been won by Executive Prime Ministers. QThe opposition, and almost the entire international community are critical about the UPFA government’s human rights record and the break-down of the rule of law. Why does the CPSL, being a constituent partner and a leftist party fail to do anything to arrest this situation? Such charges are made by pro-western countries and the Tamil Diaspora. That is not the view of the international community as a whole. Most of those charges are related to the period during the war. I do not know whether there had been excesses. As far as I know, most of those charges are politically motivated. That was why we demanded the appointment of a Commission like LLRC. Now, we are demanding fuller implementation of the LLRC report. If anything has happened, we are collectively responsible as a constituent partner of the government. We did not play an important role within the government when the occasion demanded. That was how we aborted an attempt to chop the 13th Amendment. We act with a sense of responsibility. It is more an opinion than a fact. Any one is entitled to his opinion. QWhat happened to the set of proposals presented to the UPFA by the Democratic/Leftist Front (DLF)? SLFP had discussions with the Leftist Parties bilaterally. We had discussions with the President on two occasions. There were discussions at the party leaders’ level. We met the Drafting Committee, which was in charge of the new Manifesto. We subscribed to it. We continue with our agitation for constitutional reform. I must say that as far as the progressives are concerned, they had given their mandate on our occasions. It was the forces of reaction who really opposed it. Now the forces of reaction too are ready to call for constitutional reforms. We might be able to arrive at a consensus. Whoever wins, as far as the Executive Presidency is concerned, this question will finally emerge in the Court of Parliament. The Left will play a decisive role then. QDo you agree with calling an early Presidential Election, while no one demanded it? As far as my Party is concerned, we totally opposed a hasty presidential election - We saw no reason to hold it earlier when we could go on for another two years; during which we would have done so much for the people. When we met the President, we made our position abundantly clear. Q The Geo-political repercussions in the global scenario have not affected Sri Lanka up to now. But the opposition and a majority of the international community want to stage a protest campaign similar to that of ‘Arab Spring’. Do you think this is possible in Sri Lanka? “Arab Spring” in Tunisia, thereafter in Egypt took place under totally different conditions and circumstances. Sri Lanka is no parallel under any stretch of imagination. The Opposition’s interpretation is irrelevant and illogical. “Arab Spring” emerged from the masses and there were objective factors conducive to an Arab Spring. Such objective factors are not there in Sri Lanka. The Opposition is suffering from acute subjectivism. QThe thinking among political analysts is that at the coming Presidential poll, a large majority of Tamil and Muslim votes would cast against President Rajapaksa. Do you think the President will be able to record an easy victory despite this setback? It is an acknowledged fact, that the 2015 presidential election is totally different from the 2010 presidential poll. We are watching the polarization of political forces. On the basis of a socioeconomic research study; excepting the top 10% of the society which accounts for 50% of the national income. The rest being the middle strata and the lowest strata are in favour of the President. I prefer to go by economic analysis rather than political analysis. QThe opposition complains that the inquiries and recommendations of the parliamentary watch dog COPE have failed to bring desired results, and many state ventures continue mismanagement and financial irregularities. Your comments? When you talk on COPE’s performance, it is necessary to draw a comparison with the performance of previous COPE Committee during the last 31 years from the inception of the COPE in 1979. For the 31 years, the total examinations total up to 670. Within the four years of my leadership, examinations have exceeded 700. Do not underestimate its impact on financial control. I have got my recommendations implemented within these four years. You will get a nil report for the entire past 31 years. Ours is an unprecedented record in the history of our Legislature. QLeftist political parties except old and traditional Marxists political entities like the SLCP and the LSSP have rallied round the common opposition candidate against President Rajapaksa. But you still remain with him despite the rising tide. Why? I do not think you are correct. Extreme Left Parties and groups are contesting separately on their own behalf. 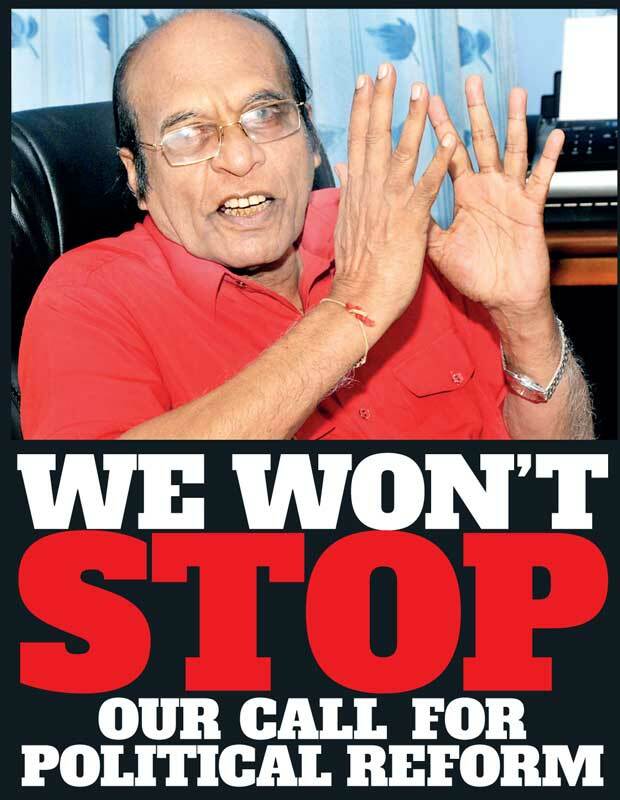 JVP takes up a queer position where it does not support the Common Candidate but proposes to defeat Mahinda Rajapaksa. Other than that, there are only INGO funded Left splinter groups that support the Common Candidate. We, of the Traditional Left born out of the anti-imperialist Suriyamal Movement, take a principled position. Presidential election is a transfer of power from one person to another, one Party to another, from one alliance to another alliance. This is not a Referendum for the abolition of the executive presidency. This is not a single-issue based election. We are required to take a position based on an all-inclusive comprehensive policy, such as Constitutional Reforms, executive presidency, foreign policy and international relations and various other issues. The strength of the Common Candidate is based on the 40% of the UNP vote bank. We are not prepared to allow all our achievements reversed and embark upon far rightist policies.